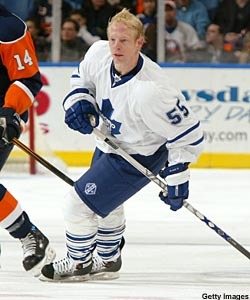 Jason Blake's return to the island was marred by his turnover which lead to the game-winning goal. Blake’s bummer — Jason Blake certainly hadn’t pictured his return to the Nassau Coliseum ending the way it did. The New York Islanders honored Blake with a video tribute before Wednesday night’s game with Toronto, his first visit to the Coliseum since he signed with the Leafs this past summer. Not only did Blake not score a goal, it was his turnover that led to Mike Comrie’s game-winner with 9.6 seconds left in overtime as the Islanders beat the Leafs 4-3. After the tribute, the near-sellout crowd spent the rest of the night booing Blake, a 40-goal scorer on last season. A tiny bit better -- The Buffalo Sabres have been hot for two weeks. The Ottawa Senators have been hot for more than two months, enough to put them well in front of the pack in the Eastern Conference. So how much difference was there between the two on Wednesday night, when the Senators left HSBC Arena with a 5-3 victory? “They ended up at the end of the night being the little-bit-better team,” Buffalo coach Lindy Ruff said. Ottawa forward Dany Heatley agrees that there’s not too much separating the teams — and not a lot they don’t know about each other because they meet eight times a year. Don’t call Bruce Boudreau an “interim” coach any more. Boudreau had that dreaded word removed from his title hours before the Washington Capitals continued their improved play under their new bench boss with a 3-2 victory over the Tampa Bay Lightning. Boudreau started his day by having the “interim” removed from his title as coach. He ended it with a victory when Matt Bradley’s goal with 2:53 remaining broke a 2-2 tie. "We all treat him as a coach here — and not as an interim coach," said forward Matt Bradley, whose goal with 2:53 left in regulation broke a 2-2 tie. "He definitely deserves it." Washington is now 8-5-3 since Boudreau took over when Glen Hanlon was fired on Thanksgiving Day. They’ve gone 5-1-1 against their Southeast Division rivals. Jaromir Jagr ended his ten game goal drought in last night's win over Carolina. Drought is over — Ten games without a goal left Jaromir Jagr’s confidence a little shaken. Two goals against Carolina on Wednesday may give the New York Rangers’ captain a boost. 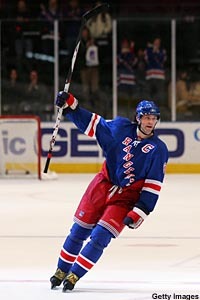 “I know it had been a long time," Jagr said after scoring the Rangers’ first and last goals in the 4-2 victory. "It's not easy for the confidence. When you have chances and you haven't scored for a long time, sometimes you do things you wouldn't when you're hot, on a streak. You hit posts or try to make sure it's a perfect shot. Hopefully, it's behind me." Center Scott Gomez, who set up both of Jagr's goals, thinks his linemate is ready for a big surge. "Jaromir is starting to dominate like he used to," Gomez said. "We'll just keep it going to help the team win." A (post)-Christmas surprise — Even the Dallas Stars were stunned at their big offensive showing against the Minnesota Wild. The Stars had their biggest offensive night in more than two years by routing the Wild 8-3; Minnesota hadn’t given up that many goals in more than five years. They usually do against Minnesota: Dallas is 10-1-1 in its last 12 meetings with the Wild. But the Stars had scored just nine non-shootout goals in their four meetings last season. The kids are all right — Who needs stars like Henrik Zetterberg and Tomas Holmstrom? Apparently not the Detroit Red Wings, who’ve cruised to back-to-back wins with two of their big guns in dry dock. The Wings’ young talent has been stepping to the fore, especially Valtteri Filppula, who scored twice in Wednesday’s 5-0 victory at St. Louis and has seven goals in nine games. "I got a couple lucky bounces and my teammates made some great plays setting me up," he said. "I was in good position and they got me the puck." It’s not that he wants to have his top players on the injured list, but Wings coach Mike Babcock is happy to get a chance to test his kids. "Injuries give you the opportunity to find out how good some of the other guys are," Detroit coach Mike Babcock said. "Actually, it helps your team get deeper over time. If your team is a good team, the injuries will make your stronger." Who needs ‘em? — Detroit wasn’t the only team to win its first game after the Christmas break despite injuries. Columbus was without top scorer, Rick Nash, out with a sore throat, while forwards Fredrik Modin, Michael Peca and Manny Malholtra were sidelined with injuries. But the Blue Jackets still beat Atlanta 2-0, mostly by shutting down one of the NHL’s top offenses. "Guys came in and were ready to play and we played a simple game," said goalie Pascal Leclaire, who faced just 21 shots in his NHL-high seventh shutout. "If we play that kind of hockey when our stars come back there's no reason we shouldn't win a lot of hockey games." Even coach Ken Hitchcock, who has seen his team struggle after a strong start, was pleased with his team’s effort. "We really played hard," Hitchcock said. "We did an unbelievable job of checking and creating chances in the first two and a half periods." Crowd? What crowd? — Chicago hockey fans are starting to come back to the United Center. More than 20,000 turned out for Sunday’s 3-2 win over Edmonton, and 20,511 filled the building on Wednesday to see the Hawks’ 5-2 win over Nashville. But one person who doesn’t think about the crowd is Hawks’ goalie Nikolai Khabibulin, who was superb against the Preds with 30 saves. "I don't think about that,” he said of the fans. "I just step out on the ice and do the best I can. I'm just happy we've won four straight." Road-ice advantage — The road team continues to have the edge when the San Jose Sharks and Los Angeles Kings meet. The Sharks’ 3-2 victory at Staples Center on Wednesday was the fifth in as many tries for the visiting team in the teams’ season series. The win was the Sharks’ seventh in a row away from San Jose, setting a franchise record. They are 13-3-2 on the road, but just 6-9-3 at the Shark Tank. To coach Ron Wilson, the difference is that it’s easier to play a simple game away from home.